The dryer comprises of a bed of molecular sieve material contained in an upright steel cylinder. The cylinder has a removable top cover for filling and cleaning the unit and a bottom outlet port for draining the molecular sieve material. It is fitted with lower inlet pipe to which is fitted a 16swg filter and an upper outlet also fitted with a 16swg filter. Screwed onto the outlet is a fine filter, which has a changeable pleated paper element. 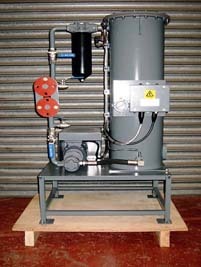 A 1� BS10 table D flange terminates the pipework connected to the other side of the fine filter. The inlet pipe is fitted to a positive displacement pump by means of a short length of hydraulic hose. A 1� table BS10 table D flange also terminates the inlet to this pump. Fixed to the outlet pipe from the steel cylinder is a pressure switch. This is designed to prevent damage to the sieve in the event of a blockage and is preset to operate at 30psi and will cut the pump motor. Also fitted to the outlet of the steel cylinder is a differential pressure switch. This monitors pressure drops across the molecular sieve bed and will operate at a differential pressure of 15psi indicating that the molecular sieve material requires replacing. A pair of paralleled no volt contacts are fitted in the terminal box from these relays to give remote indication of operation if required. The unit�s terminal box is fitted with two LED indicators, one green and the other red. Operation of these is explained in the operational instruction section of the manual The inlet and outlet pipes are fitted with �� lockable ball valves for isolation of the equipment . Also �� lockable ball valves are fitted to sample points on both the inlet and outlet pipes. The molecular sieve assembly is mounted on a steel frame with four mounting feet. The feet have 12mm holes in them to allow the complete unit to be bolted to the floor if required. All materials used in the construction of the molecular sieve are Stainless steel wherever possible. All materials used in the construction of the molecular sieve are Stainless steel wherever possible.